This page last modified March 18, 2019. March 27, 2012: Needlework System 4 will be raising their prices on April 15 (the first price increase they have had in twelve years). If you have been thinking about ordering any of their items, now would be the perfect time to beat the price increase. Needlework System 4 is a brand of needlework stand that is made primarily of extruded aluminum (lightweight, strong and will not rust). Their primary product is a floor stand (available in regular and travel version) but they also make a version that clamps on to a table and another version that sits on your lap or can sit on top of a table. To make the Needlework System 4 more affordable for our customers, our prices are DISCOUNTED from normal retail markups; we also take extra steps to keep your shipping cost as low as possible by dropping shipments off in person at a Fed Ex store rather than pay extra to have packages picked up at our store (that saves you at least $3.00 per shipment and also means in most cases we can ship the same day we receive an order). Therefore NO OTHER DISCOUNTS are possible. Please note before you buy that Needlework System 4 items are not returnable. We would have to charge much higher prices than we do if we were to allow returns of Needlework System 4 items, as returned items could not be resold to other customers as new at our already discounted price. We would have to discount them to the point where it would no longer be profitable (in addition to that, the fees charged by credit card companies are not refunded to us when an item is returned, so we are also out the credit card fee plus cost to process a return). Therefore we are unable to offer free in-home trials of their products. We have all items available to see and try in our store and are happy to answer any questions about how this product works and what it will and won't do but all Needlework System 4 sales are final. That doesn't mean you risk getting a defective product; in the very rare cases where there is a manufacturing defect, the manufacturer in Florida is very good about taking care of the issue. Two main advantages of this floor stand are its small "footprint" - it does not take a large amount of floor space - and the ease with which it disassembles/folds down for storage. It takes two "components" to make a complete working stand. The first component would be the floor stand itself; for the second component you have the option of getting a "frame clamp" to hold stretcher bars, a scroll frame, or a Q-snap holder (Q-Snaps are white PVC plastic square or rectangular frames). You cannot use other brands of scroll frames in this stand, but you CAN use the dowels made by either K's Creations or Gripit in the Needlework System 4 scroll frame, for additional size options. Due to extra charges to us when shipping some combinations of Needlework System 4 products (due to package dimensions and weight), an additional shipping surcharge could apply. If you order a combination that requires a shipping surcharge, we will let you know prior to shipping. The Needlework System 4 floor stand weighs about 2.5 pounds (1.15 kilograms). It is totally adjustable in angle and height (up to a maximum height of 36"). It will fit under most furniture (requires only about 1 3/8" clearance or slightly over 3 centimeters). It comes with non-slip rubber "feet" to protect your floors. For the ultimate in portability, or for those who wish to travel with their Needlework System 4 floor stand, it is also offered in a travel version. Pictured to the left as it is packaged for shipping, this is almost identical to the regular floor stand (but is slightly heavier, almost three pounds, or 1.3 kilograms). The Travel Mate floor stand collapses down to about 27" (will fit in some luggage), and it is about 2" taller than the regular floor stand when fully extended. It was redesigned in 2009 so that it collapses in a telescoping fashion. It is raised by pushing a button and pulling up until the button clicks into place in an upper hole. Once it is fully extended, it is adjusted to the most comfortable working height merely by changing the angle of the upright leg of the stand (this is the same way the regular floor stand height is adjusted). Pictured to the left for comparison purposes are the Travel Mate Floor Stand on top and below it, the regular Floor Stand as they are packaged for shipping, so that you can see the difference in size. The shine in the picture is from plastic which is partially wrapping the stands for protection during shipping. 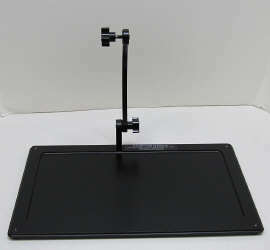 The Needlework System 4 lap stand will hold a Needlework System 4 frame clamp, small or medium scroll frame or Q-	holder (you must purchase these separately; large scroll frame not recommended for use in lap stand). The lap stand consists of two parts. The first is a flat solid metal base with a small lip. As designed by the manufacturer, the Needlework System 4 scroll frame or the Q snap holder attach DIRECTLY to this flat base. The second part is a curved metal piece that is designed to be used with the frame clamp; it attaches to the flat bottom base and sticks up at the angle you select; then you attach the frame clamp to the top of the curved piece. Some people do choose to use the curved piece on their lap/table stand when using the Needlework System 4 scroll frame or Q snap holder; it's your option to get the height/angle you want while making sure it is still stable. A bonus feature of this lap stand is that the upright curved piece that holds the frame clamp can also used as an extension piece on the floor stand (best used on the regular stand, not the Travel Mate). If you have both a lap stand and a floor stand, when you are not using the lap stand you can remove this piece from it and attach it to the floor stand to get an additional 9" of reach (of course you can also buy this extension piece separately). The lap stand base measures 16" wide by 10" and has a weight of about 3 pounds or 1.4 kilograms (this is the weight of the lap stand only; to this you would need to add the weight of your top which will vary depending on which top you use with it). 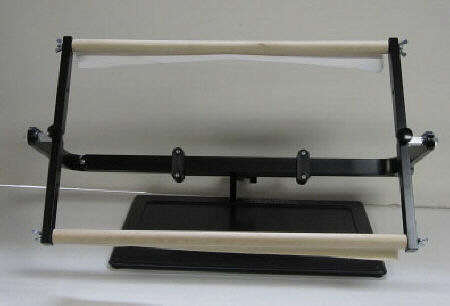 The lap stand as pictured on our website is the model currently produced by Needlework System 4. It replaces an old style that was discontinued many years ago. Needlework System 4 Table Clamp clamps onto a table, and will hold either a frame clamp, scroll frame, or q-snap holder (purchased separately). It weighs 1 pound 11 ounces (.8 kg). Also available is an optional accessory that can be added to the Needlework System 4 floor stand to make the stand reach even further. The extension piece will bring the working area of your frame about 9" closer to you (or to put it another way, you can keep the floor stand itself further away from your body and still be able to reach your frame). If you already own the Needlework System 4 lap stand, you also have the option of removing the upright curved piece from the lap stand (which is the same part as the extension piece) and using it as an extension piece on your floor stand. Our personal recommendation is that the extension piece is best used with the regular floor stand, not the Travel Mate version. The reason is that adding it to the Travel Mate may introduce more movement/wiggling to the top of the stand; it is more stable when added to the original floor stand. When you add the extension piece to a floor stand, and then add a frame clamp, the frame clamp will initially be upside down; to remedy this all you need do is pretend you are tying off threads on the back of your work and then "flip" the frame clamp left or right so that it is once again right side up (easier to do with stretcher bars in the clamp than without). 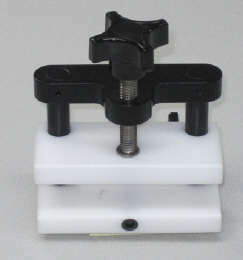 The Needlework System 4 Frame Clamp is designed to hold wood stretcher bars and weighs just under one pound (410 grams). Once attached to the floor stand, it rotates 360 degrees left or right so that you can easily flip to the back of your work - without loosening or tightening any knobs or wingnuts! 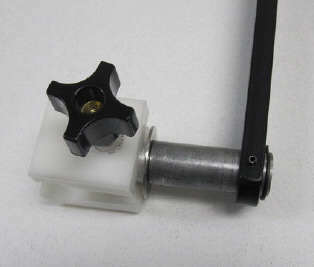 In fact, it is SO easy to turn that many people are confused about how to turn the frame clamp. First of all, you do NOT turn it at the point where the frame clamp attaches to the floor stand. Once the frame clamp and floor stand are "mated" and the knob tightened to hold them together, you should not try to move them where they join. Instead, insert your stretcher bars in the frame clamp, and turn to the back by holding the stretcher bars on the left and right sides. Then push down on either the left OR the right side of the stretcher bar; the rotation works in either direction. 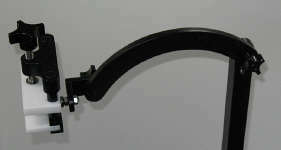 The frame clamp jaw opens 1 1/2" wide and is made of safe plastic. 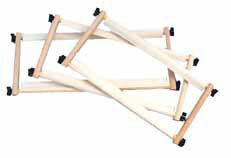 The Needlework System 4 Scroll Frame comes in three sizes. Each size is adjustable in width with a minimum and maximum width, depending on what size of dowels you use in it. In all 3 cases the metal scroll frame side bars measures 12" long. When the dowels are inserted the dowels are 11" apart so your maximum working area in height is just a little less than 11". If for some reason you prefer a smaller working area, additional holes are available on the side bars so that in addition to 11" apart you can also position the dowels 8 1/2" apart or 5 1/2" apart. Needlework fabric is attached to wood dowels by sewing (hand-basting works fine) to fabric tape that is attached to the dowels. The Needlework System 4 scroll frame rotates freely 360 degrees (from top to bottom or in a vertical rather than horizontal direction) without the need to loosen or tighten knobs or wingnuts. To rotate it, do NOT try to force the scroll frame where it attaches to the floor stand. Rotate by pushing down on either the top or bottom scroll frame dowel. 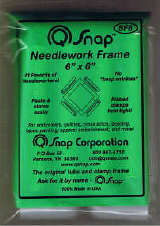 For those who prefer to mount their fabric in Q Snap brand frames, Needlework System 4 offers a Q Snap Holder. This will accommodate Q Snap frames from 8" wide to 17" wide (Q Snap frames are NOT included with Needlework System 4 stands and must be purchased separately). The Q Snap holder weighs about 1 pound or .4 kilograms. The Q snap holder adjusts in width in two different places. One place where it adjusts in width is at the top of the Q snap framework, which can be pulled apart (sideways) to increase the width or pushed together to decrease the width. The second place where the Q snap holder width adjusts is the metal mechanism on each side that the two plastic clamps are attached to. By pushing in, you decrease the width, by pushing out you increase it. 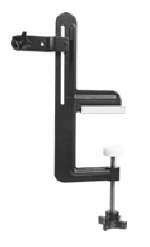 Light/Magnifier Holder attaches to the upright post of the floor stand or Travel Mate floor stand. It does NOT attach to the lap/table stand or table clamp. 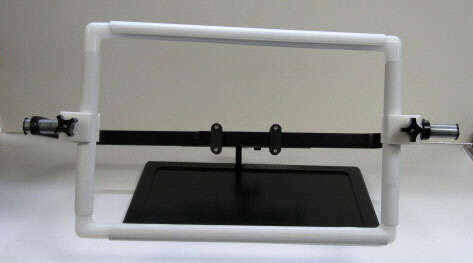 Sheet Holder attaches to the Light/Magnifier Holder and uses magnets to hold a chart in place. The flexible gooseneck part of the sheet holder measures approximately 24" from one end to the top of the rectangular sheet holder. Special note: as of February 2018 this is currently unavailable as this product is being redesigned, and we are sold out of the old style sheet holder. Scissors Tray -also attaches to the Light/Magnifier Holder. Belt Frame is a small scroll frame which rolls sideways rather than top to bottom and comes with 10" side dowels. It would be used on projects that are wide but not very tall (such as a belt). Below are individual prices for separate Needlework System 4 components, followed by some combination prices for a few of the more popular combinations that people order. Needlework System 4 has a metal rug frame system. This is really just a large scroll frame that attaches to TWO existing Needlework System 4 floor stands. Those who already own a single floor stand will need to buy an additional floor stand plus the special large scroll frame to make up the large rug frame. Those starting from scratch would need to buy two floor stands plus the special roller frame. 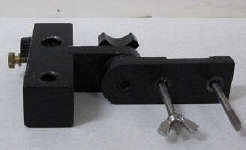 This roller-type frame comes with 56" dowels but we are told any length of dowels would work in the system, provided they are compatible dowels (such as those made by K's Creations or Gripit; please note that some other brands of dowels will not work due to how the dowel ends are made). The working area in height (size between top and bottom dowel) for the rug scroll frame is 15". The large rug scroll frame is $140.00; if you need the large rug scroll frame plus one floor stand (to use with a second floor stand you already own), the price will be $269.00. If you need to start from scratch and buy two floor stands plus the large rug scroll frame, the price will be $398.00. Additional shipping charges will apply depending on the configuration of products you order, due to the size and number of packages that must be sent and UPS surcharges for oversize packages. With a product this expensive, people sometimes ask if it can be discounted. Our Needlework System 4 prices are already discounted by adding a much lower than normal markup, to make it as affordable for you as we can, so the prices we charge are firm. Remember, you are making an investment in a product that you will be using for many, many years to come. K'S CREATIONS LAP FRAMES are very useful needlework frame holders. They are designed with an adjustable sliding base to hold stretcher bars or scroll frames of various sizes. When you don't have space or inclination for a floor stand, the K's Creations lap frame is excellent. It supports your frame on both sides - another similar type of lap frame on the market only supports the work on one side, so that it has a tendency to droop. These are really lap/table frames, as they can be used either on top of a table (it helps to clamp them to the table or to rest a heavy weight on them) or on your lap. They fold down for traveling. 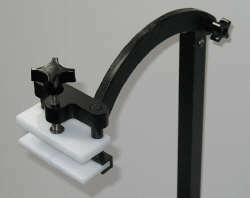 In 2010, K's Creations modified the manufacture of their lap stands, and also had a price increase. Lap stands will now be all wood (previously they were wood but with a plastic channel for sliding) and all new style frames will come with black tri-knobs instead of wing nuts. We will have a mix of old style and new style stands for a while. There are three sizes of K's Creations Lap Frames: the Baby Base, adjustable from 9" to 13"; the Standard Base, adjustable from 13" to 22"; and the Large Base, adjustable from 22" to 34". The K's Creations Lap Frame can hold either scroll frames or stretcher bars, depending on which attachments you buy. 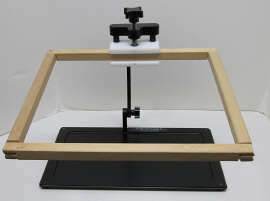 You can buy it with the scroll frame included or universal clamp included. Please note that if your existing scroll frame has no spare holes drilled on the side bars, or if the holes are drilled for a smaller-than-standard bolt, you will have to drill a new hole or increase the size of the existing hole in order to use it with the K's Creations lap frame. If you order the universal clamp version of the lap frame, your frame will come with 10" "pivot arms" (these are the side arms that come up from the base to hold the clamps). 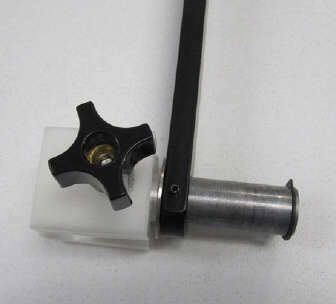 If you order the scroll frame version of the lap frame, your frame will come with 7" pivot arms. You can also buy most of these parts separately if you already have some of the parts but wish to add others. (This all gets very confusing because there are so many permutations possible. If you have questions, please ask!). All K's Creations products come with an unconditional lifetime warranty. K's Creations Lap Frames used to come with wing nuts and a wooden wing nut tightener. Changes made to their product several years ago means all new lap frames now come with black triangular plastic knobs. Bases are now 100% wood without a plastic channel that used to come with old frames. Bases will now open up 2" wider than in the past. K'S CREATIONS LA PETITE frames are for smaller projects. With a smaller, nonadjustable base than the regular K's Creations frames, this may be ordered with a universal clamp to hold stretcher bars (stretcher bars not included) or with a 9" scroll frame. Also unlike the regular K's Creations frames, the La Petite uses only one arm to hold your work (this keeps the weight down and allows more clearance for your hand). The La Petite comes equipped with the nice black plastic triangular knobs on the stand itself so they do not need to be ordered extra; however, the La Petite with 9" scroll frame does come equipped with wingnuts on the scroll frame itself. If you wish to replace the scroll frame wingnuts (there are 4) with knobs, they will cost extra. 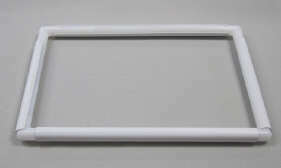 K's Creations ScrollFrames consist of two side bars with two dowels. Your fabric is attached tothe dowels with a running stitch, and the fabric is rolled up onto the dowels except thesection you are working on. 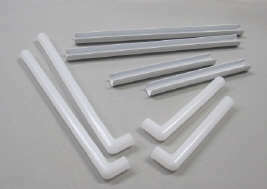 Various dowel lengths are available. PLEASE NOTE THAT 9" and 13" scroll frames will come with 7" side bars; while 16" through 34" scroll frames will come with 10" side bars. Also, when you buy scroll frames by themselves, not as part of a lap frame set, the scroll frames will come with four black plastic knobs rather than wing nuts, so it is not necessary to order extra knobs. K's CREATIONS DOWELS(scroll rods) are available separately so that you can use your existing scroll frame sidebars with different sizes of dowels. All prices are for a PAIR of dowels. Sizes of dowelsnot listed are available by special order. K's Creations Scroll Frame Side Bars are also available separately. 10" HIGH PIVOT ARMSreplace the standard 7" arms which are standard with the K's Creation scroll frames bases to holdthe scroll frame. We find the extra height to be very useful as it gives you more freespace for your hands, but if you travel with your lap frame a great deal, the extra height will result in a slightly larger lap frame to carry or pack (frames with universal clamps automatically come with 10" pivot arms). MAGNET BOARD HOLDERS for K's Creations lap frames attach to a sidearm for you to use with a product such as the Loran magnet board (not included) for working from a graph. STRETCHER BARS (standardwidth, 3/4") are an inexpensive product used to mount needlework, primarily needlepoint canvas, for stitching. Fabric/canvas is held taut without using damaging hoops, fabric is handled less, and work will distort less if these are used.Attach fabric or canvas with staple guns or brass tacks (sold below). Prices are per pair,and two pairs are needed to make one frame. Order stretcher bars of the same dimensions asthe fabric or canvas (to mount a 12 by 16 inch piece of canvas, order one pair of 12"and one pair of 16" stretchers). Please inquire about availability of specific sizes prior to ordering if your need is urgent or you need a large quantity of a single size. MINI STRETCHER BARS are wonderful for smaller projects. They are only 1/2" wide. Not only are they lighter weight than regular stretcher bars, they also take up less space on the surface of your fabric or canvas, which is helpful if your project has a small margin. 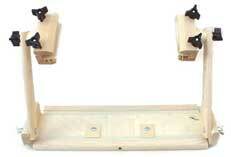 The mini stretcher bars are interchangeable with old Marie brand mini stretcher bars (no longer available). They are NOT interchangeable with standard size stretcher bars, and can only be used with other mini stretcher bars. EVERTITE BRAND STRETCHER BARS are specially made wood stretcher bars which allow you to tighten your canvas or fabric while on the frame without removing and reinserting tacks. Although we try to keep a good supply of these on hand, it is recommended that you contact us before ordering to check availability in the size and quantity you need if your needs are urgent. Sizes not listed are available by special order. Remember to order two pairs to make a complete frame (one set for the top and bottom, the other set for the two sides). The tightening feature of these stretcher bars requires that you buy a "T Tool" (sold separately, see end of stretcher bar listing) or use a 3/32" hex key wrench. BRASS TACKS by Clover are sturdy, flat-topped tacks which are used to mount fabric on stretcher bars. There are 60 tacks to a package, with a plastic tack removerincluded at no extra charge (we recommend putting at least one tack every inch around the perimeter of the stretcher bars for best results). HARDWICKE MANOR HOOPS are a high quality brand of wooden embroidery hoops made of birch wood with a nice finish. They are very sturdy with heavy-duty hardware. They come in three hoop thicknesses, 5/16" (very thin), 5/8" (standard) and 7/8" (very thick). 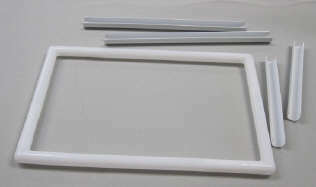 Q Snap frames are square or rectangular white needlework frames made of PVC pipe. Square or rectangular frames give you a bigger working area than round hoops. Each frame is made of four separate sides (letting you mix and match sizes) with four outer clamps that hold fabric onto the frame. You may easily adjust tension by rotating the outer clamps (in to loosen fabric or out to tighten it). 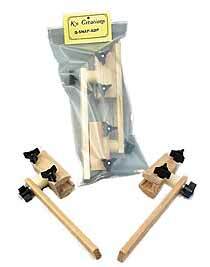 Extension kits for Q Snap frames are available in two sizes. 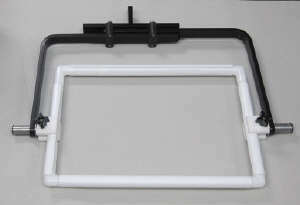 The 14" extension kit will turn an 11" x 11" Q Snap frame into a 14" x 14" frame. 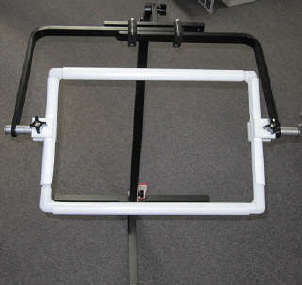 The 20" extension kit will turn a 17" x 17" Q Snap frame into a 20" x 20" frame. A Q Snap Spare Pair consists of one-half (two pieces) of a Q Snap frame. This lets you mix and match sizes (for example, if you own an 11" x 11" Q Snap frame but want to turn it into an 11" x 17" frame, you can do so by using two of the 11" sides you already own and adding two 17" sides. 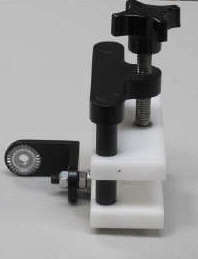 Lights and light/magnifier combinations are available from us made by a variety of manufacturers. Having said this, our current favorite brand of lights and magnifiers is the Daylight Lighting Company. This is due to a number of reasons but includes the range of products, affordability, quality of light and the excellent service this company provides. Needlework lights and lights with magnifiers are constantly changing. For that reason, we are no longer showing them on our website, although we do carry some lights and light/magnifying combinations in our retail store. If you need advice on lights or want to see about ordering one from us, please contact us directly to discuss options and prices. Flexilens with Clamp from the Daylight Company provides a magnifier only, when additional light is not needed. It is the same 5" diameter 3 diopter/1.75x magnifier used in the Ultimate Daylight Lamp. 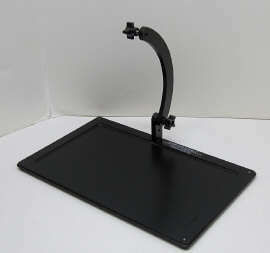 The magnifier is attached to an 18" flexible gooseneck, with a clamp that attaches to a table. 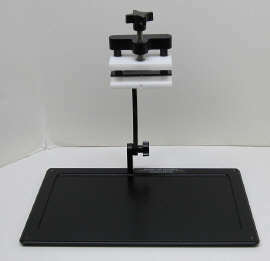 A similar magnifier is available to sit on top of a table rather than attaching with a clamp, please inquire. Flexilens on Miniclip by the Daylight Company is a very lightweight magnifier intended to be used directly on a frame such as an embroidery hoop or stretcher bar. Please note that the miniclip magnifier is NOT the standard magnifier used on other Daylight Company products. It differs by having a smaller (3.5") lens and a stronger magnifier (5 diopter/2.25X). 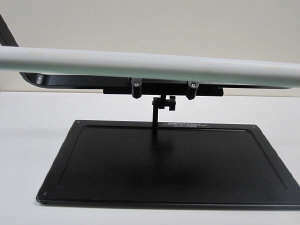 Long Flexilens on Miniclip by the Daylight Company is exactly the same magnifier as pictured and described above, except it has a flexible gooseneck that is 3" longer for a length of 10". After trying various brands of scissors from various countries, I continue to believe that among the best embroidery scissors on the market are those from Gingher. All Gingher embroidery scissors come with a leather sheath and a manufacturer's guarantee. Floss-a-Way Zip Lock Bags measure 3" x 5"" with a hole punched in one corner for placing on a hardware ring. They also have a place for writing down the thread name/color. The advantage of storing threads this way is that more than one skein/card/spool can be stored in a bag, and you don't have to spend time wrapping thread on a bobbin. Loran Magnet Boards are extremely useful for all forms of charted needlework (people who knit, crochet, tat, etc. find them useful for holding directions as well). The metal board comes with several magnetic strips which hold the pattern in place on the board, and which can be positioned immediately around the area of the pattern on which you are currently working. No one should be without one. TAPESTRY NEEDLES have blunt tips and large eyes, for counted thread embroidery and canvas embroidery. The higher the number, the smaller the size. Bohin tapestry needles are made in France. They have a nice finish and overall general quality that many stitchers prefer now that most of the needles that used to be made in England have been out-sourced to save money. CHENILLE NEEDLES are similar to tapestry needles, but have sharp rather than blunt tips. CREWEL NEEDLES are sharp, have shorter eyes than tapestry or chenille needles, and are most commonly used for non-counted embroidery. These are Hemming brand needles. They are now coming labeled "Embroidery Needles" rather than "Crewel Needles" but the needles are the same. BOHIN CREWEL NEEDLES are sharp, have shorter eyes than tapestry or chenille needles, and are most commonly used for non-counted embroidery. These are Bohin brand needles. MILLINER'S NEEDLES are longer than other needles and have fairly small eyes. They are excellent for making bullion stitches as they are the same diameter almost the entire length of the needle. They are known in some countries as "Straw Needles." These are Hemming brand needles. (for other fabrics) but have eyes like tapestry needles, for easier threading. These are very small needles and will go through almost all beads, including size 14 or Mill Hill Petite beads. LORAN TAPESTRY NEEDLE THREADERS are for threading larger eye needles, such as tapestry and chenille needles. Their unique design make threading simple - insert the threader in the needle eye, lay the thread over the hooked end of the threader, remove the threader - and your needle is threaded! The threader has a small hook on one end and large hook on the other, to accommodate both large and small needles. Needle Threaders from Klaer International comes in three varieties. The Ultra Fine Threader is designed to be used with very fine needles (between size 12, sharp size 11 and 12, milliner size 11 and beading size 10 and 12). Stronger than other similar products, the wire threader is embedded into plastic so less likely to pull free. The wire can still break, especially if you try to pull through a thread that is too large or pull too forcefully; use with care. All-Purpose Threader is designed to be used with size 1-10 sharps, embroidery/crewel, milliners and between needles (for sizes 11 and 12 use the Ultra Fine Threader shown above). Like the Ultra Fine Threader, it is longer lasting than similar threaders because the wire is firmly embedded in the plastic. This threader comes with two bonuses: a built-in safe thread cutter, and a tiny hole to allow you to tie it to an object so that it does not get lost. Needlework Threader is designed to be used with both tapestry and chenille needles, which have long eyes. Surprisingly, it is even designed to be used with needles as small as size 28 tapestry and chenille (but we are told by the manufacturer that it will not fit in the smallest of the Piecemaker brand tapestry needles). Like the All-Purpose Threader, it comes with a built-in thread cutter and hole for attaching to other objects such as a pair of scissors. ALSO AVAILABLE is a gift pack containing one each of the above three threaders, for $7.25. TROLLEY NEEDLES are made of large tapestry needles which have been welded to adjustable metal rings. Wear one on the finger of your choice, and lay your thread over it as you stitch to control thread twist and tension. This is not as precise a laying tool as the tekobari but does have the advantage of leaving both of your hands free for grasping. CLOVER BRAND AWLS are very well made with sharp points (much better than the awls you typically find in a fabric store). They are used for piercing holes in fabric (such as small broderie anglaise eyelets), and are also useful for enlarging a hole in needlepoint canvas, as is sometimes required to allow a heavy thread to pass through, or to make an eyelet. There are two types of awls available. One is used to make very small holes of a uniformly small size (about 3/32"). The other type can be used to make various sizes holes up to about 5/32" (the awl itself gets larger than that but there is a limit to the size of a hole that can be enlarged in fabric - larger eyelets are best made by cutting). KOMA are Japanese wood spools used in metal thread embroidery. They have a squared off top and bottom to prevent them from rolling when laid down. Real metal threads are wound on them prior to stitching. 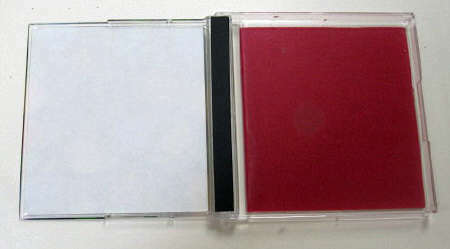 Sold in pairs, as metal threads are typically couched in pairs. UNCLE BILL'S TWEEZERS are not extremely sharp, but grip well at the tip. They are approximately 2" long. They are useful for removing cut threads, pet hairs, etc. from fabric. BODKINS are a little like big, flattened needles. Use them to thread ribbons, etc. through a channel - they are a MUST for inserting other threads in Rachel. NAP BRUSH (also known as a "Bunka Brush") is a device that is used to raise a nap on your stitching (makes it fuzzy) to achieve realistic furry effects, etc. 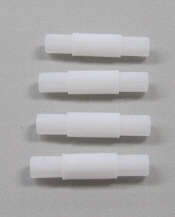 BEAD NABBERS by Loran make it much easier to sew beads onto needlework. Worn on your finger, they have a tip that will pick up and grip several beads at once, ready to be put on the tip of your needle. 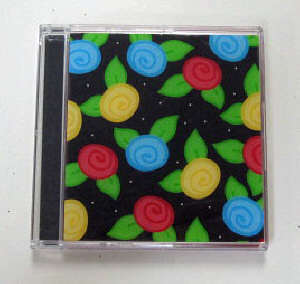 TACKY BOB is a plastic case with a tacky surface on the inside (both sides) that will grip beads that are poured onto it. 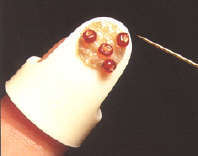 It is very handy for beading whether at home or when traveling. The case comes with assorted designs on top. Inside is a magnetic needle holder and acid-free tacky lining; on the outside the bottom is non-skid. please contact us as we do have others in stock.